So, what are your dreams and desires? 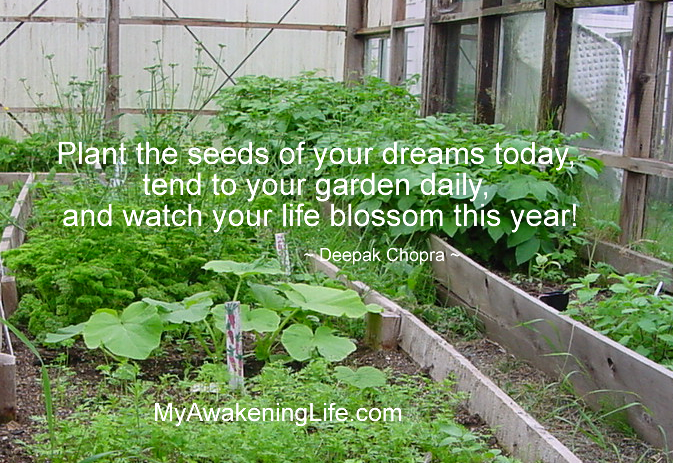 Write them down and visualize them as tiny seeds that you plant. Then let go of all expectations. When things don’t go the way you expected, there is a reason. Look for much greater rewards. Stay in the present moment of awareness through meditation and mindful living. Accept the present moment exactly as it is. Make room for your deepest intentions and watch them sprout from the heart and grow into beautiful plants of life. Pursue every freedom I have, for who knows what tomorrow may bring ~ and only through pursuing the pure-freedom of what I dream can I at least begin to understand the possibilities. Wishing you a great 2017 (and a great springtime ahead! ).